We love steak at house Brown Sugar Garlic Flank Steak, Grilled Steak Fajita Skewers, and Creamy Garlic Steak Bites with Mushrooms are some of our favorite steak recipes on the blog. My ten year old steak loving son is always begging for steak every single week. 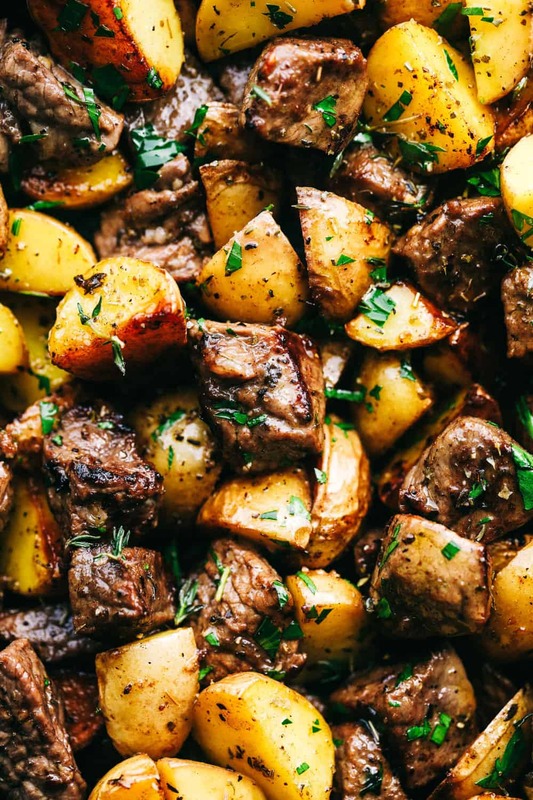 He loves steak and potatoes, and I love easy meals, so it is a win win situation. 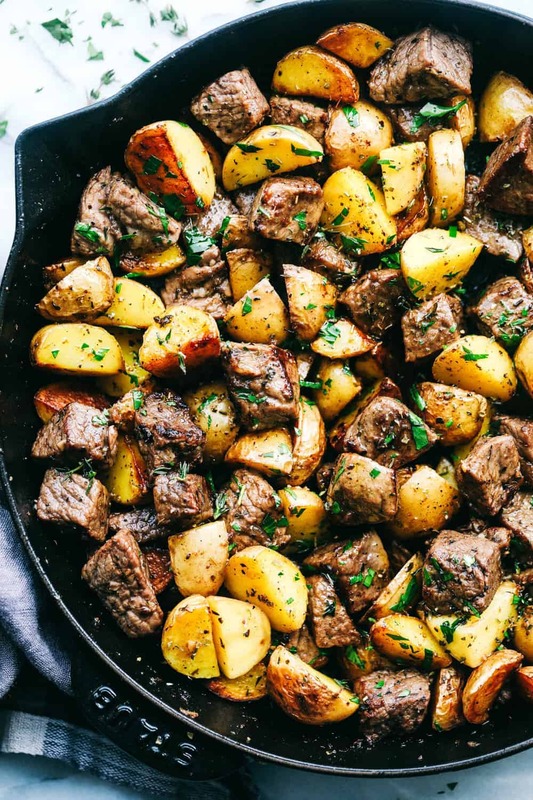 Nothing better than steak and potatoes… am I right? Cooked in a buttery garlic herb sauce, this meal is full of flavor and one your family will love! How do you make garlic butter herb steak bites? Turn the skillet to high heat. Add the steak bites. Let the steak sear for a minute and then continue to stir the steak until they are golden brown. What side dishes do I serve with this meal? This meal is great served with a simple side salad and dinner rolls or garlic bread. This dish looks yummie! Question: Steak Bites… your receipes show what seems to be a pretty quick cook time for the steak. I tend to avoid steak because it can be tough or hard to chew. How can I prepare steak (and steak bites) so that they do indeed “melt in your mouth” and aren’t hard to chew? Is there some pre-prep procedure I could do? the potatoes look to be wedges..not slices.does it take longer to cook? Yes, it will take a little longer to bake. Yes, let me know how it turns out! Hi, I just made this tonight…thank you for a delicious recipe! It’s super easy to make for a weeknight meal. 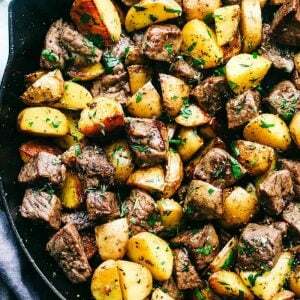 The sirloin and potatoes cook quickly so just make sure to stay on top of that. I made a side of roasted brussel sprouts with bacon to complete the meal. Hi Alyssa.. My name is Mìchele. Today I came across a) Recipe for Garlic Butter. 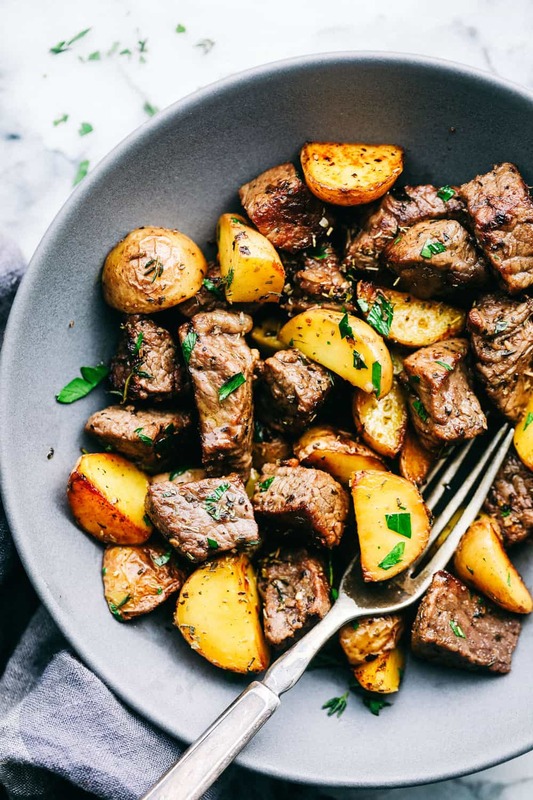 S+teak Bites with Potatoes. I would like to make it this week but I need a couple off questions answered first. First, if I decided. to grill them In foil, also should ! Spray the foil with before adding potatoes? Also, could I put a couple corn on the cobs on the grill or carrots and corn the oven packets? Wow! This was a very fine meal. My only adjustment was to steam the potatoes for 5 minutes. I don’t have the best of luck cooking raw potatoes in a skillet without them falling apart. My husband is already looking forward to leftovers and I plan to make these for company soon. Thanks for the FABULOUS recipe. I made this last weekend and it was so fast and easy to make! I made it in a regular pan since I don’t have a cast iron and it cooked up just fine! Delicious! Definitely going in my recipe box. We had this for dinner tonight. YUM!!! It did take closer to 25 minutes for the potatoes to cook. I also added another minced clove of garlic to the final tablespoon of butter that’s used to cook the steak. Excellent flavors! We had a salad and rolls. I saved a piece of my roll to absorb the garlic butter that was left on my plate. Again, YUM!! Can you use the dried spices instead of the chopped fresh you specify to use with the potatoes? Thank you! Its looking delicious. Thanks for sharing with us.